King Cruiser Wreck is 85 metres long, 20 metres wide twin hulled car ferry sank on 4th May 1997, about two thirds of the way from Phuket to Phi Phi Islands, when it struck the submerged pinnacle of Anemone Reef. As well a taking a big chunk out of the reef the collision to a chunk out of one of the hulls causing it to take on water and eventually sink. Thankfully all of the 500+ passengers were evacuated with no casualties. Now it is a Top Phuket Diving Site. There are many stories as to why the boat was so far of course but the insurance company paid up so the truth will probably never be known. The boat initially sank on it’s side hitting the sand at 32 metres and then rolling onto its hulls, this impact caused one of the smoke stakes to fall off. A few years later the other smoke stack collapsed onto the deck. 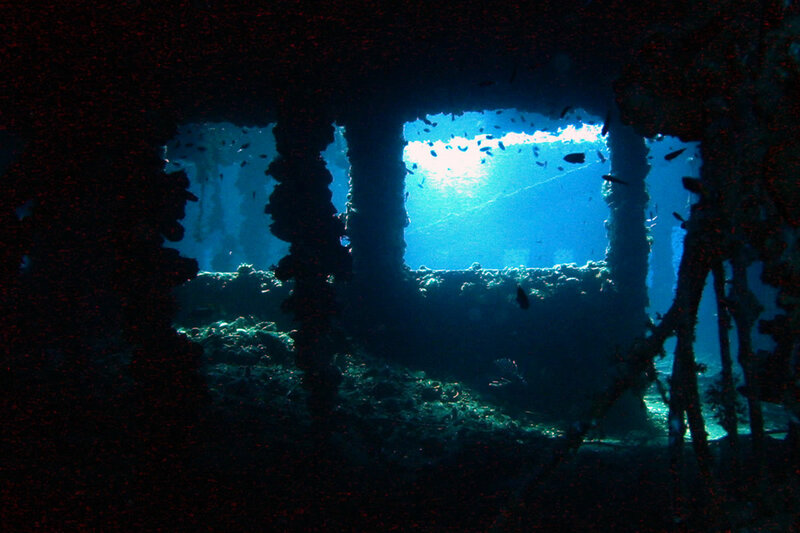 For many years divers swam through the empty car deck (there are no roads on Phi Phi so the car deck was only used for supplies) leaving their bubbles behind to get trapped in the superstructure. Then in August of 2004 a storm along the coast of Thailand caused the wreck to collapse, a split developed along the centre of the main deck and the passenger lounges collapsed into one another, since then it has slowly continued to deteriorate. Nevertheless it is improving as a dive site as it is now a magnet to shoaling fish, huge groups of Snappers, fusiliers, Jacks and Barracuda use the wreck to hide from the current. The back of the wreck still boasts its main feature – the toilets. There are large areas of soft corals on the back of the wreck as well as plenty of black corals in sheltered areas. With the highest point on the boat being at about 16 metres this is very much an advanced level dive.